Shen Yun Performing Arts is globally renowned, bringing Chinese culture and history — ancient dynasties that thrived long before the rise of Western civilization — to stages all around the world. “Through the universal language of music and dance, Shen Yun weaves a wondrous tapestry of heavenly realms, ancient legends, and modern heroic tales, taking you on a journey through 5,000 years of Chinese culture,” according to shenyunperformingarts.org. The performance features stunning aesthetics, classical Chinese dance, beautiful handmade costumes, animated backdrops and a live orchestra playing Chinese and Western instruments. I had the chance to view the performance with my parents last year and thought Shen Yun was nothing short of ethereal. Its website, brochures and posters around town depict performers in costumes so colorful and sheer they appear to be illustrations. This gives casual onlookers a glimpse into the show, which is every bit as visually mesmerizing. The vibrant garb and backdrops only serve to augment the lively, synchronized dancing. Other entertaining elements of the show include skillful martial arts, humor in the form of mischievous monks and the infamous Money King and performances from bel canto soloists. 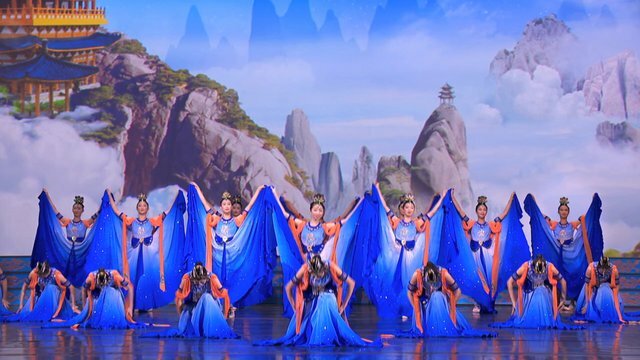 While Shen Yun is very multifaceted, the dancing is central; Chinese dance has played a role in preserving its expansive culture. The dancing is built on traditional aesthetics and was once passed down in imperial courts and through ancient plays. It’s been refined for thousands of years and has developed into the distinct style audience members can see on stage today. Shen Yun performers, such as principle dancer Angelia Wang, are all classically trained in this art form that combines leaps, flips, spins and other aerial techniques. The orchestra enhances the artful dancing, bringing the narratives of early folklore to life through music. The show begins when a gong is struck. From there, ancient Chinese instruments such as the erhu, a bowed instrument with two strings, and pipa, a four-stringed instrument that is plucked, take over. They lead the melody and are supported by a full orchestra of Western strings, percussion, woodwinds and brass. This blends an energetic Western orchestral sound with delicate Chinese instruments, creating a unique musical experience. An aspect of the show that may surprise audience members is the religious undertones. For starters, the name “Shen Yun” roughly translates into “the beauty of divine beings dancing.” While this is supposed to suggest that the experience is so beautiful that it brings to mind a sense of the heavens, it may also bring to mind an element of religion to many. The website notes that divine beliefs throughout dynasties — something that the Chinese government has tried to undermine — are an integral part of the culture. It also mentions that Shen Yun artists find their source of inspiration rooted in the spiritual discipline known as Falun Dafa (also known as Falun Gong). Those who practice Falun Dafa are persecuted in China and Shen Yun’s production is prohibited in China. In Shen Yun, there are a few acts that seem to be politically charged. For example, there is a scene near the end during modern times in which tourists appear to be beaten by Chinese police officers who think they are members of Falun Dafa. However, Shen Yun claims that the political messages are a misconception. It instead claims that any religious themes serve to enlighten and convey a positive message, such as the Falun Dafa’s principles of truthfulness, compassion and tolerance, rather than be used as political agenda. When I watched the performance last year, I noticed the somewhat politically-oriented scene with the tourists and how the tone of it was different than the rest of the production. I will admit that it caught me off guard a bit. However, I did not think it was so overpowering or heavy-handed that it took away from the overall experience. Some reviewers and critics note that the political theme borders on propaganda; I did not feel that that was the case. If anything, it serves to convey a message about religious freedoms and divine inspiration. Regardless of the religious undertones, it is undeniable that the blend of Chinese dance, music, costuming and artistic backdrops makes Shen Yun a one of a kind experience. There are not many dance troupes, or performance groups in general, that bring what Shen Yun brings to the stage. The production gives Cincinnatians and those around the world a glimpse of China’s extensive history — one that is very rich, but rarely in the limelight. That is why the Shen Yun, whether slightly political in nature or not, is worth a watch.